My father is from Peru and yet I know so little about the Peruvian wine industry. Follow me along this learning curve as I learn all about the interesting wines and distilled wines of Peru. Peru is widely known for Pisco, which is a distilled wine or brandy which is produced in the winemaking regions of Peru and Chile. There has long been a battle between who makes the best Pisco and heavy, very heavy border control on this grape brandy. Pisco was originally developed as an alternative to orujo, a pomace brandy, by Spanish settlers back in the 16th century. It is now a well-known and well-developed industry for both Peru and Chile. 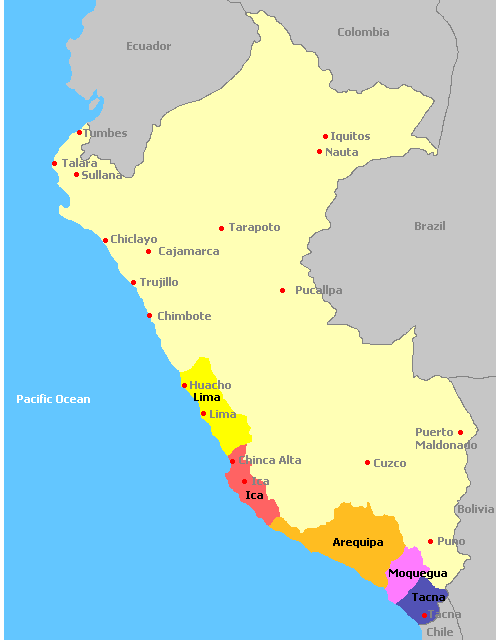 Below is a map by Wines and Vine Search on the Wine Regions of Peru. Ica is the area in which Pisco is mainly made.